Landscape architectural services for a new 207,700 sq.ft. BEQ building, 14,306 sq.ft Armory and 650 space parking garage on a 32.45 acre site at MCB Camp Lejeune for NAVFAC Mid Atlantic. 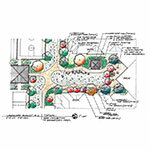 The project site included special features such as two sand volleyball courts, two basketball courts, two regulation horseshoe pits and four outdoor courtyards with overhead structures, built in gas bbq’s, ada seating along with other amenities. The site design also included native/adaptive plants, large retention ponds, a jogging trail with fitness course and a cohesive streetscape design. The project qualified as LEED gold, and abides by all UFC’s, ATFP and other military codes.